Michele Bachmann’s CIA-ACLU whopper, and other CliffsNotes from Saturday’s CBS News/National Journal foreign policy debate. Read on for the Mother Jones news team’s instant analysis of Saturday night’s GOP presidential debate Spartanburg, South Carolina. 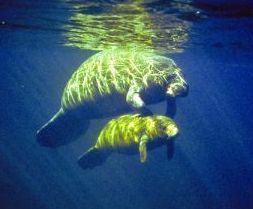 Did you miss the Republican foreign policy debate tonight? So did I, sort of. I spent about a third of the time watching the Stanford-Oregon game, about a third of the time following my Twitter stream—which was far more entertaining than the actual debate—and about a third of the time actually listening to the debate itself. So my insights are limited. A couple of random notes. Virtually the entire debate was focused on national security: Pakistan, Afghanistan, Iran, and the Middle East. Pakistan was mentioned constantly, and virtually every candidate took the opportunity to demonstrate that they knew the phrase “Haqqani network.” However, not a single one of them mentioned the word “India,” without which any discussion of Pakistan’s motivations is completely worthless. Maybe next time. Moderators Scott Pelley and Major Garrett did a weak job in general and a terrible job on Europe. Which is to say that in a 90-minute debate taking place while Europe is practically melting down as we speak, they didn’t mention Europe once until the last two minutes. They managed to ask Jon Huntsman one question about Europe and Rick Perry half of a question. Nice work, guys. Herman Cain almost charmingly demonstrated that he simply knows nothing about the outside world, and Rick Perry beat expectations by not imploding spectacularly again. All of the candidates insisted that they’d take a completely different approach to Iran than Barack Obama, but then proposed doing almost exactly what Obama is doing. For the most part, though, as Dan Drezner says, the candidates kept the crazy bottled up fairly well. But not always. Fred Kaplan’s review of the crazy is here. Below are my favorite moments from the debate, both good (Huntsman and Paul on torture) and bad (just about everything else). Consider this the Cliff’s Notes version of the debate. This is a very dangerous time. If you look at Iran and if you look at Pakistan and if you look at the links with Syria — because Iran is working through proxies like Syria, through Hezbollah, through Hamas — it seems that the table is being set for worldwide nuclear war against Israel. And if there’s anything that we know, President Obama has been more than willing to stand with Occupy Wall Street, but he hasn’t been willing to stand with Israel. Israel looks at President Obama and they do not see a friend. You have said about foreign policy, “America needs to be clear about who its friends are and who its foes are.” So this evening, sir, Pakistan, friend or foe? We don’t know. Because Pakistan is where Osama bin Laden was found and eliminated. Secondly, Pakistanis have a conversation with President Karzai from Afghanistan and President Karzai has said that if the United States gets into a dispute with Pakistan, then Afghanistan’s going to side with Pakistan. There is a lot of clarity missing, like Speaker Gingrich says, in this whole region. And they are all interrelated. So there isn’t a clear answer as to whether or not Pakistan is a friend or foe. That relationship must be reevaluated. For ten years, I have been the commander in chief of over 20,000-plus individuals in the State of Texas as we’ve dealt with a host of either natural disasters or having deployments into the combat zone. So, if there’s someone on this stage who has had that hands-on commander in chief experience, it is me, as the governor of the State of Texas. I believe that following the procedures that have been established by our military, I do not agree with torture, period. However, I will trust the judgment of our military leaders to determine what is torture and what is not torture. That is the critical consideration. In the last campaign, Republican nominee John McCain and Barack Obama agreed that [waterboarding] was torture and should not be allowed legally and that the Army Field Manual should be the methodology used to interrogate enemy combatants. Do you agree with that or do you disagree, sir? I agree that it was an enhanced interrogation technique….I don’t see it as torture. I see it as an enhanced interrogation technique. Well, waterboarding is torture. It’s illegal under international law and under our law. It’s also immoral. And it’s also very impractical. There’s no evidence that you really get reliable evidence. Why would you accept the position of torturing 100 people because you know one person might have information? And that’s what you do when you accept the principle of torture. I think it’s uncivilized and has no practical advantages and is really un-American to accept on principle that we will torture people that we capture. We diminish our standing in the world and the values that we project, which include liberty, democracy, human rights, and open markets, when we torture. We should not torture. Waterboarding is torture. We dilute ourselves down like a whole lot of other countries. And we lose that ability to project values that a lot of people in corners of this world are still relying on the United States to stand up for them. Romney: Well number one, on day one, it’s acknowledging something which everyone knows, they’re a currency manipulator. And on that basis, we also go before the WTO and bring an action against them as a currency manipulator. And that allows us to apply, selectively, tariffs where we believe they are stealing our intellectual property, hacking into our computers, or artificially lowering their prices and killing American jobs. Huntsman: The reality’s a little different as it usually is when you’re on the ground. And I’ve tried to figure this out for 30 years of my career. First of all, I don’t think, Mitt, you can take China to the WTO on currency-related issues. Second, I don’t know that this country needs a trade war with China. Who does it hurt? Our small businesses in South Carolina, our exporters, our agriculture producers. Let me just address Congressman Paul. Congressman, I respect that you wore the uniform of our country. But in 1972, I volunteered to serve the United States Air Force. And the idea that we have our young men and women in combat today, where there are people who would kill them in a heartbeat, under any circumstance, use any technique that they can, for us not to have the ability to try to extract information from them, to save our young people’s lives, is a travesty. [VOICE RISES] This is war. That’s what happens in war. And I am for using the techniques, not torture, but using those techniques that we know will extract the information to save young American lives. And I will be for it until I die. What would I cut? I think, really, what I would want to do is be able to go back and take a look at Lyndon Baines Johnson’s The Great Society. The Great Society has not worked, and it’s put us into the modern welfare state. If you look at China, they don’t have food stamps. If you look at China, they save for their own retirement security. They don’t have pay FICA. They don’t have the modern welfare state. And China’s growing. And so what I would do is look at the programs that LBJ gave us with The Great Society, and they’d be gone. How do you prevent the European crisis from become a problem on Wall Street? And that’s a wrap! Time ran out at that point, so we’ll never know just what painfully ignorant point Perry was about to make. Lucky guy. 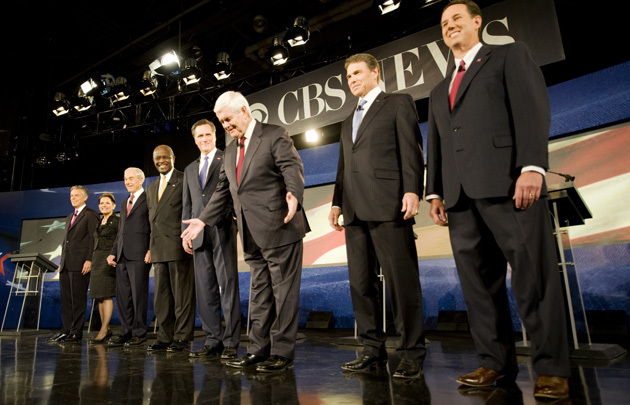 During Saturday’s CBS News/National Journal “Commander-In-Chief” debate—the first 2012 GOP debate to focus exclusively on foreign policy—the candidates were thrown a couple questions on the War in Afghanistan. For the most part, the Republican contenders responded as expected. Mitt Romney said that “the right course is for us to do our very best to secure the victory that has been so hard-won” through sacrifice and hundreds of American lives, which is exactly what he’s been saying about both Afghanistan and Iraq for a while now. Unsurprisingly, perennial back-runner Jon Huntsman responded by echoing his standard, dovish line on the war: get the troops out ASAP. But what was mildly surprising was that he answered the question in Barack Obama’s words. 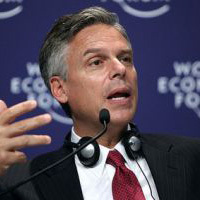 Perhaps Huntsman’s former employer has been rubbing off on him more than he’d like to admit. Saturday night’s GOP presidential debate in South Carolina focused on foreign policy, which was bad news for Herman Cain. By his own admission, it’s a subject he doesn’t know much about. And it showed. Taking the first question of the debate, about how he would address the prospect of a nuclear Iran, he offered a solution to a problem that doesn’t exist. 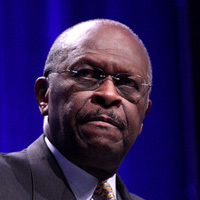 Cain’s big point—one he’s made before—is that he would defeat the Iranian regime by choking their economy. Specifically, he would develop American energy sources (in the form of offshore oil drilling, among other things) so that we’re no longer reliant on hostile nations for resources. That sounds nice. He sounded confident enough as he rattled off his talking points. But there’s a problem: The United States doesn’t currently get any oil from Iran. If a Cain administration would try to curb Mahmoud Ahmedinejad’s power by increasing domestic oil production, that wouldn’t have any impact on the Iranian economy. In the long-term, domestic energy self-suffiency is a positive. But in response to the immediate threat of a nuclear Iran—a long-term energy plan doesn’t mean anything. Long the subject of fringe groups, Agenda 21 has taken on more prominence in recent years. Michele Bachmann fought against it as a Minnesota state senator, and again as a congresswoman. As she said in 2008 of congressional Democrats, “They want Americans to take transit and move to the inner cities. They want Americans to move to the urban core, live in tenements, [and] take light rail to their government jobs. That’s their vision for America.” The non-profit education watchdog she worked with in Minnesota even went so far as to oppose International Baccalaureate, the worldwide advanced placement system, on the grounds that it undermines national sovereignty and furthered the goals of Agenda 21. Does Gingrich really believe any of this—or is it just a pander to the far-right? At Saturday’s CBS News/National Journal “Commander-In-Chief” debate, 2012 Republican candidate and tea party darling Michele Bachmann recited two very popular memes on the American right: A) Barack Obama is a devoted follower of Occupy Wall Street, and B) he wants to feed Israel to the dogs. 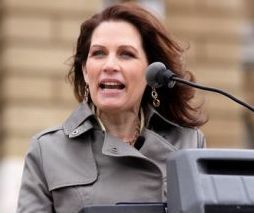 Obama is “more than willing to stand with Occupy Wall Street” but “not willing to stand with Israel,” Bachmann said to loud applause from the South Carolina audience. She added that Israel doesn’t see “a friend” in Obama. Given Bachmann’s patented kicked-into-overdrive tendency to say and endorse pretty out-there stuff, neither comment came as much of a shock. However, let’s just get some quick debunking out of the way. In some ways, they’re not that different from some of the protests that we saw coming from the Tea Party. Both on the left and the right, I think people feel separated from their government. They feel that their institutions aren’t looking out for them…The most important thing we can do right now is those of us in leadership letting people know that we understand their struggles and we are on their side, and that we want to set up a system in which hard work, responsibility, doing what you’re supposed to do, is rewarded. Lastly, it’s fairly obvious that Obama does not want to defriend Israel. Despite talk of the “Jewish backlash” that supposedly came from his recent unflattering comments about Israeli Prime Minister Benjamin Netanyahu and his mention of 1967 borders early in the summer, the Obama administration has stayed steady on military aid, played it super-safe on the Palestinian bid for statehood, and expressed Washington’s “ironclad” commitment to Israel’s security over and over again. If Israelis aren’t supposed to “see a friend” in Obama, then, according to recent polling, somebody forgot to tell the Israelis. PELLEY: How do you prevent the European crisis from becoming a problem on Wall Street? And what?!? How was Perry going to wind this up when he was saved by the bell and Pelley cut him off? He obviously had no clue what to say about any of this and was about to wander off into free association land. All we can say is that at some point during what passes for debate prep in the Perry camp, someone mentioned the term “sovereign debt” and Perry was going to try to make some point about it. But what? 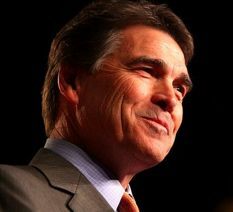 In comments, please finish up Perry’s remarks for him. You have 30 seconds.